The Visual and Performing Arts Department at Michigan Technological University welcomes you to the 2014 Great Lakes Showcase, an annual juried exhibition of fine art and craft. A community mainstay for over 35 years, the Showcase celebrates the vibrant artists who work and visit the Upper Peninsula and surrounding region. Thank you for helping to celebrate creativity in our community and beyond. Thank you for supporting Great Lakes Showcase artists! Once you purchase an artwork, it must remain on view for the duration of the exhibition. In addition, it must be picked up on April 1 between 8am and 8pm. Staff will be on hand that day to help you retrieve the artwork and sign it out. If you have questions please contact Sarah Fayen Scarlett at sfscarle@mtu.edu or (906) 487-2067. Tony Orrico, /Vessel for Governing and Conception/ (2012). Photo by Juan Cano. Courtesy of the artist and MARSO. 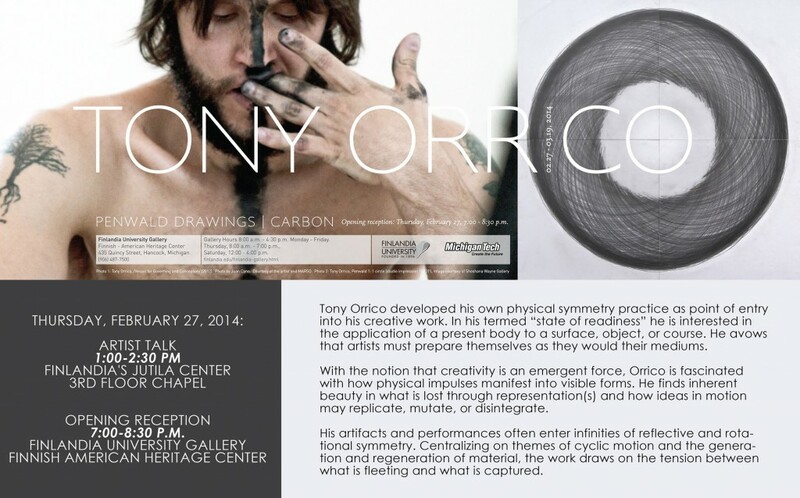 Tony Orrico will present work from his Penwald Drawings and CARBON Series. Penwald Drawings are a series of bilateral drawings in which Orrico explores the use of his body as a tool of measurement to inscribe geometries through movement. 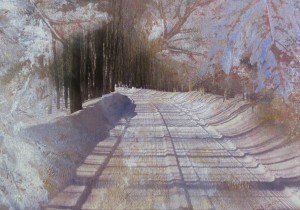 He uses a physical practice, symmetry practice (circa 2005), as point of entry into this work. In his termed “state of readiness”, he is interested in the application of a present body to a surface, object, or course. His gestures derive from the limitation of (or spontaneous navigation within) the sphere of his outstretched arms. Line density becomes record of his mental and physical sustain as he commits his focus to a greater concept of balance throughout extended durations of drawing. Centralizing on themes of cyclic motion and the generation and regeneration of material, the work draws on the tension between what is fleeting and what is captured. The master of each drawing is a conceptual score of which he only produces eight times on paper in his lifetime. In the CARBON series, body, graphite, plane, time and space combine to become powerful reflections on life cycles, energetic flows and complementary opposites. His repetitious movements, often leading to exhaustion, become deep metaphors about life and death simultaneously. Tony Orrico has performed/exhibited his work in the US, Australia, Belgium, China, Denmark, France, Germany, Mexico, the Netherlands, Poland, and Spain. His visual work is in collection at The National Academy of Sciences (Washington DC) and Museo Universitario de Arte Contemporáneo (Mexico City) as well as prominent private collections. He has recently been presented at SCAD: deFINE ART, Cranbrook Art Museum, New Museum, and Poptech 2011: The World Rebalancing. In June he will perform Penwald: 2: 8 circles: 8 gestures at Center Pompidou-Metz. Orrico will be collaborating on research and an exhibition with Finlandia University Gallery and the International School of Art & Design, along with Michigan Technological University’s Visual and Performing Arts and Computer Science Departments. Students and faculty from both campuses will be involved as Orrico works in The Mind Music Machine (tri-M) Lab, an interdisciplinary research group based in Cognitive and Learning Sciences and Computer Science at Michigan Tech. From Finlandia Future Gallery Exhibits. TechAlum Newsletter – From the Email Bag- links to a Facebook video of the 1981 NCAA consolation game, Tech vs. Northern. Watch vintage Pep Band pride, courtesy of TV6 & FOX UP. Associate Professor Christopher Plummer co-advised a project entitled “Auditory Emoticons: Iterative Design and Acoustic Characteristics of Emotional Auditory Icons and Earcons,” which was presented at the colloquium on Wednesday, February 19, 2014. The work was co-authored by Jason Sterkenburg, a graduate student in Cognitive and Learning Sciences, and Assistant Professor Myounghoon Jeon in Cognitive and Learning Sciences.